Remove the combo part and it'll be viable. That still makes it pretty horrid. All this card needs is either a decent stat buff (5/5 rather than 5/3) or a cost reduction (5 mana, maybe 4). It would be nice if this card got changed a little so that it was actually playable. Were it to undo Mind Control effects by bouncing stolen cards back to your hand (MC, Cabal Shadow Priest, Entomb, Sylvanas Windrunner, Mind Control Tech), this could become a decent anti-priest card that sees SOME play, but that would still require priest to become a viable class, rather than a frustrating, occasional nuisance. I have played this a few times in my control rogue deck for fun...really fun card! Not sure if it's competitively viable but the element of surprise is awesome more than anything. Is it the best card? No, but fun design, and allows a little more flexibility in playing Sap. 1) 3 health means it's most likely going to die to a 2 mana minion/ spell the next turn anyways. 6 mana for a sap and a minion that gets killed for 2 mana = 4 mana value. At 5 mana that is just a 1 mana loss, making the risk of losing him before he gets to attack acceptable. 2) The entire point of combo cards is that they CAN get huge value if you plan your turn wisely. 3 mana for a 2/2 minion is terrible, but Van Cleef can also be a 3 mana 10/10 or more. Nobody complains that he's overpowered. Classic cards will update in future , this cards have a chance..............maybe ??? I read that before the beta his mana was 5, and he was too OP, so they nerfed it to 6 and didn't change his stats. 5 mana 5/3 with a great effect might see some play. Yeah doesn't look great for its stats. Perhaps Blizz thought it is worth more than Sap or a Panda because you can choose a minion from either side? That kinda ignores that on either Panda the effect is 'free' on top of a well-statted vanilla minion and Sap costs only 2 on its own. 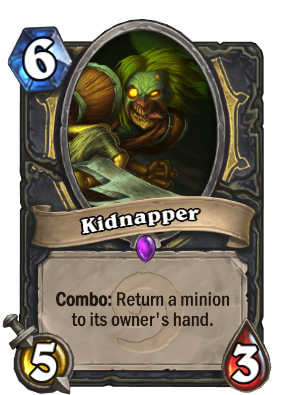 Another way to fix it maybe is to change the text to "Return a minion to its owner's [*or: your] hand. Combo: this costs (2) less". With Combo you'd get a 4-mana 5/3 which isn't great but not terrible either, plus the combo triggers a Sap for free. As this is a class Epic that seems reasonable. This is probably the most common epic for me to get. It should just add a free sap to your hand OR make the minion you put back in your hand cost less. this really needs a buff. Your version makes so much sense. wtf is wrong with Blizzard? Not only would it make more sense, considering the card's name, but it would also make its cost actually appropriate. Agree with all above, but should work like Freezing Trap. "Combo: Remove an opponent's minion to your hand. That minion costs (2) more." Unless they're afflicted with a heavy dose of Stockholm syndrome I don't think they'd fight for you willingly. Makes it fair value and I like the idea of having a kidnapped Deathwing in my hand that I'm unlikely to ever be able to play.